Pushing right on through October, my husband and I celebrated his birthday yesterday. For yesterday's outfit, GwynnieBee gave me the opportunity to try a brand that I've only heard about, but never had the chance to try or see. My vest complete with leather trim is from MYNT1792. 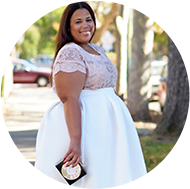 They just did an amazing blogger/design collaboration with some of plus size's most awesome bloggers. Just as I was doting on the campaign, this shows up at my doorstep. That's one of the awesome perks of GwynnieBee. Even I haven't tried everything that is out there, but this allows me a no risk solution to try the product, especially when that brand may carry a heavier price tag. From what I've seen thus far, me likey! Style Note: I actually saw this dress pass through a facebook post from Plus Model Mag. I am such a shopper. I literally find a lot of the items I buy just from social media. Thank God tight season is here. This dress is shorter than I like to wear, but with a pair of opaque tights, it works. FYI, I've had these tights 2 years now. Now despite my appearance, I am not very dainty (more like a bull in a china shop) and I can tear up a pair of tights. These are a bit more expensive, but they have lasted. After two years, I am just about to replace them. I cannot find that dress or the similar option. Can u post the direct link. Also any cheaper suggestions on the vest? You are so my style inspiration...you look super duper cute :-) !!!! I know you told us before but what color lip and liner are you wearing? I know its MAC... but what's the color its amazing on you. Sweet!!! Thanks as always... You are super cute with an awesome shape...and I love your style. Happy Monday!!! 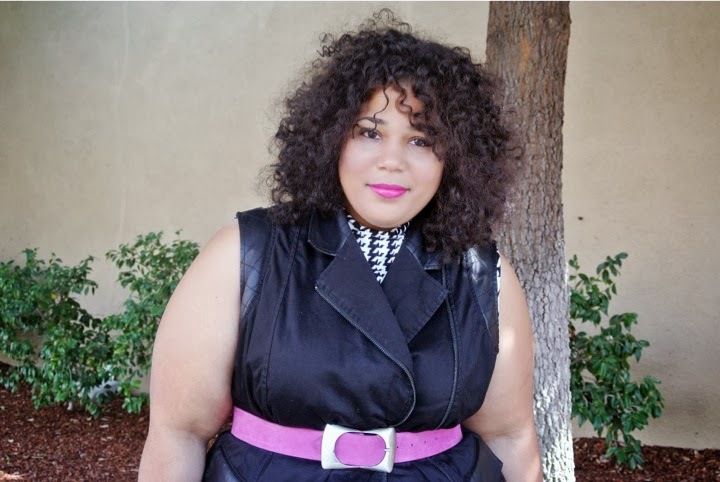 I was just eyeing this dress on the Ashley Stewart website. I love how you've styled it, I would never have thought to pair it with a vest like that. You look awesome as always! You have really inspired my Fall wardrobe! I just cannot get over how you make every outfit look perfect and effortlessly stylish. Girl you are the man! :) sending love greetings from South Africa. LOLOL I'm the man!!! Love it & thank you!! Yes! 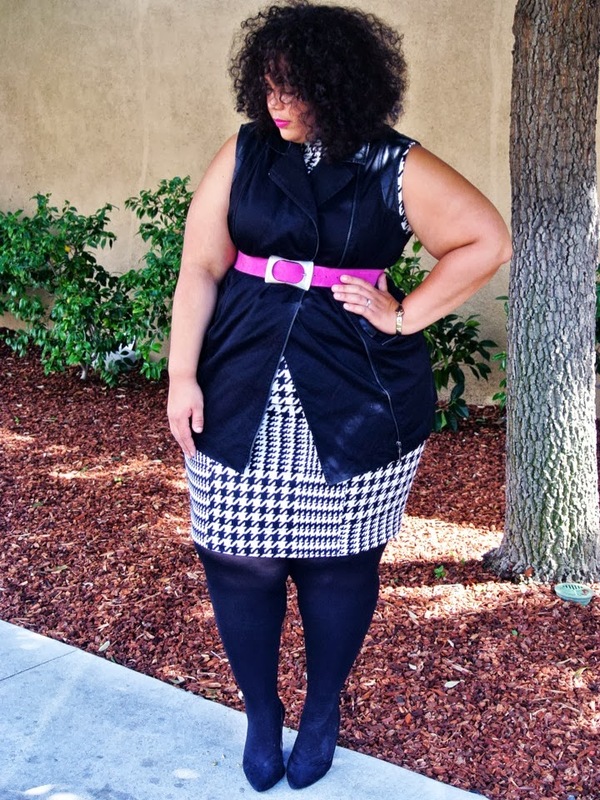 Houndstooth, check, leather, check, pop of color CHECK! nice color combination i think its best..